June 9, 2018 2 comments on "Rose Petal Jam Canning Recipe"
We moved to live closer to the mountains a few years ago. One of the wonderful things we are now enjoying is the beauty of wild roses every May-June. I have been looking for ways to preserve the scent of these beautifully fragrant flowers. This year I am canning rose petal jam for the first time. There is nothing like the scent of fresh roses. For some reason wild roses have a much stronger scent than roses I have ever grown in my yard. I enjoy taking walks in the mountains in the spring to pick wild roses. It’s even more fun to take them home and try new recipes with them. So far I have made rose petal jelly, rose simple syrup, rose petal tea, and rose petal infused honey. If you are wondering what the difference is between rose petal jelly and rose petal jam, the difference is that you leave the rose petals in the rose petal jam. It might seem kind of weird to think about eating rose petals, but it is better than you might expect! It has the consistency of orange marmalade. I love rose petal jelly too, but the jelly is a bit firmer. This jam is not completely jelled, it stays a little syrupy, but set just enough to spread on your toast. Canning rose petal jam is a great way to preserve your jam all winter. I looked around for a good recipe and was inspired by this recipe. You don’t have to can it though! If you are not going to can it, then after you prepare the jam just place it into the refrigerator and eat it in the next month or so. If you want to can the jam, then follow the easy canning instructions below. Word of Caution: When picking rose petals for using in recipes, make sure the roses have not been sprayed with any kind of insecticides. You should also not pick roses right next to the road side, to avoid the exhaust fumes from cars. Place your rose petals in a colander and rinse them thoroughly to make sure you get rid of any dirt or insects. Place the rinsed rose petals and water in a large sauce pan. Simmer for 10 minutes. Add sugar to the mixture and stir until sugar is completely dissolved. Stir in lemon juice. The lemon juice should brighten things up a bit, it brings back the original color of your roses! Darker roses will result in a darker jam, and light colored roses will result in a lighter colored jam. Sprinkle the powdered pectin on top of the mixture and stir to combine. At this point, if you do not want to can the jam, you can just pour it into jars and refrigerate it. This recipe makes approximately 4 half pints or 2 pints of jam. 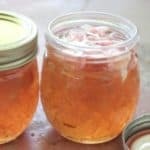 If you want to can the jam, then sterilize your jars, lids, and rings. Pour the jam into the sterilized canning jars, leaving 1/4 inch head space. You can easily measure the head space with this inexpensive canning funnel. Place the jars in a boiling water canner, completely covering the jars with at least one inch of water. Process the jars in the boiling water canner for 10 minutes. Remove the jars from the canner and place on the kitchen counter to cool. Let the jars set for about 24 hours before moving them. The jam will be a little runny at first but will continue to gel in the next 24 hours. Sealed jars can be stored in the pantry for 1-2 years. Enjoy! 2 Comments on "Rose Petal Jam Canning Recipe"